A world renowned artist, cancer survivor, and healing arts activist with organizations such as, The ART CURE, hospitals, hospices, etc. creating Healing Through Art [c/p/r 2010 Margo Buccini] workshops and seminars. Currently developing new outreaches and Healing Through Art programs in the southeast US, she's also a member of The Society for the Arts in Healthcare. Her paintings can be found in corporate offices, fine hotels, high end automobile dealerships, luxury health spas, and private collections worldwide. She has received regional, national, and international awards and recognition for her work(s) and significant, humanitarian contributions through her compassionate and altruistic efforts; these include NEA and CETA Grants. She founded The Art Teaching Program at the Ponte Vedra Cultural Center, Ponte Vedra, Florida, the perpetually funded Westfield Artists' Cooperative, Westfield, NY, among others, and is the Co-Founder of The WORLD FREEDOM PROJECT, a global Music and Arts healing and unification production entity creating Music and Arts Expos on six continents. Published internationally in several art books and publications, she was the only non-Indian artist chosen recently to be published in “The ABC of ARTnership”, vol. II, 2009, with works both abstract and figurative. 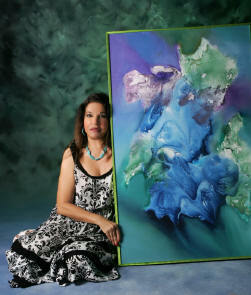 Her works exhibit versatility, depth, and range, referenced by the intense use of color and form. Her Spiral Waves Series (c/p/r/ 2010), done while she was recovering from successful cancer surgery in 2005, was recently purchased by a private, internationally well known collector. Margo received her Masters Degree in Art from CW Post University in New York, and attends retreats, residencies, & seminars, etc. in furtherance of her career goals. "Creative painting isolates the energy with life's contradictions, and brings this energy to visual reality".